Posted on November 14, 2017 at 5:30 pm. 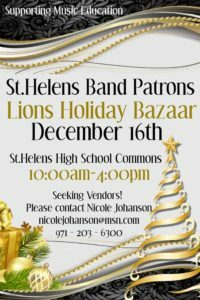 Columbia County, OR – Many local organizations host a Holiday Bazaar as fundraisers for our nonprofits like our PTO’s, band programs, and more worthy causes. The bazaars are more than just local businesses wanting to sell you something. They want to share their products with their neighbors. 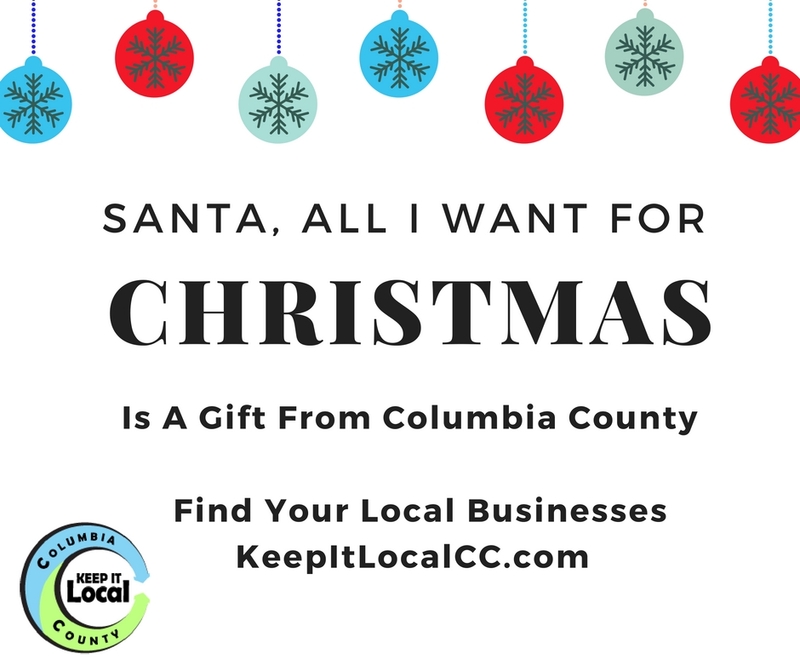 You are sure to find many reasonably priced quality goods made in Columbia County. These Holiday Bazaars offer a place to meet your neighbors and new friends. It’s part of the holiday culture out here in Columbia County. You will find many talented bakers, artisans, and artists at these local bazaars. Nov 18th – Ladies of the Elks Christmas Bazaar, 350 Belton Road, St Helens, OR from 9-3:00 PM. Large assortment of homemade goodies & craft items. Refreshments available all day long for purchase. Cake Walk & Santa 11-1. Nov 25th – Columbia County Small Business Expo– Featuring local businesses and professional services such as Wauna Federal Credit Union hosting the Kids Activities, Scott Burge Insurance, 5R Farms, Darling Foods, Saint Helens Market Fresh with a Made in Columbia County Booth and more. Expo open 10 AM- 4 PM. Santa will be on site from 10-1. Hot drinks & treats available. Fundraiser to benefit Columbia County K-9 Unit and Keep It Local CC programs. Dec 9th & 10th– Holiday Bazaar to benefit Scappoose Share & Care & Columbia County Toy N Joy 10:00 AM -4:00 PM at Oregon National Guard Armory, 474 S. 7th, St, St Helens. This is their 8th year. They have a reindeer which is an adult and kid favorite. The reindeer are on site with Santa on Sunday 10th from 11-2 PM. Photos taken by Mossbarger photography with donations requested but not required. Lewis & Clark Elementary PTO is also hosting a Holiday Bazaar on Dec 9th. 111 S. 9th, St Helens, Open to public 10-2 PM. 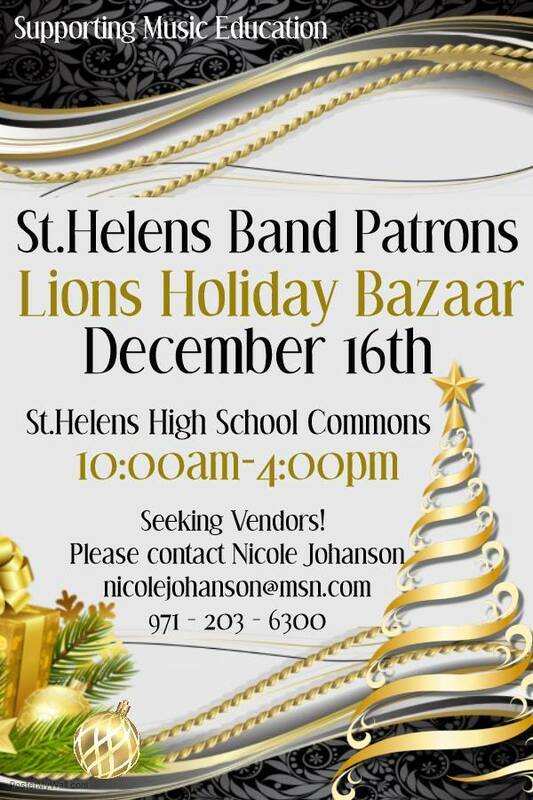 Dec 16th- St Helens Band Patrons Lions Holiday Bazaar at St Helens High School Commons 10-4 PM. Contact Nicole Johanson 971-203-6300 if you are interested in being a vendor.